That’s always been the thing with musicals—stories move along, then all of a sudden characters break out into song or dance. What? Why? And where does all that music come from? It’s all so phony, fabricated, fake—and fabulous, for people who love musicals: the songs, the spectacle, the perkiness and cheer, the sense of something bigger, grander, more expansive and more exuberantly alive than ordinary, day-to-day reality can contain or mere words can express. Movies have always been vehicles for escapism, but musicals crank it up to 11, sweeping viewers away to places where dreams can come true, everyone has magic feet and music comes out of nowhere. 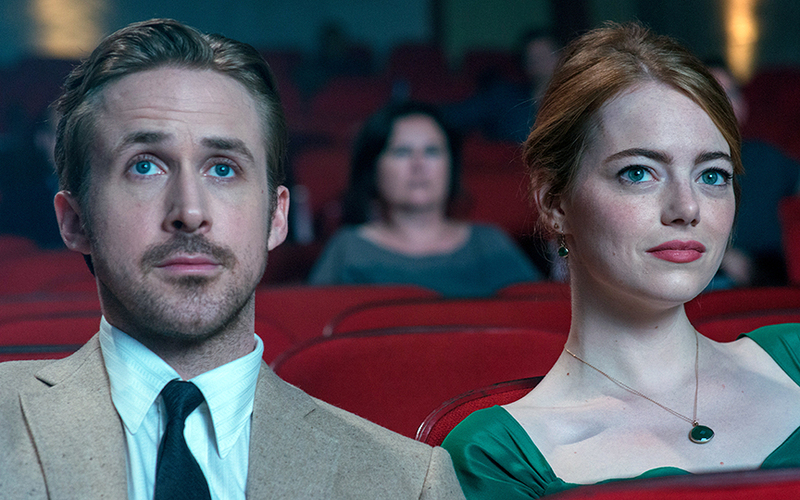 In writer-director Damien Chazell’s enchanted, visually stunning La La Land (which recently received seven Critics Choice movie awards, including Best Picture), a struggling actress, Mia (Emma Stone), and an aspiring musician, Sebastian (Ryan Gosling), meet and fall in love in Los Angeles, where their courtship is wrapped into a tapestry of songs—composed by Justin Hurwitz, Chazelle’s Harvard University classmate, with lyrics by the Tony-nominated team of Benj Pasek and Justin Paul—eye-popping choreography, a visually sprawling love letter to the city and to cinema itself, and a snazzy subplot flowing with the funky fusion-juice of jazz. 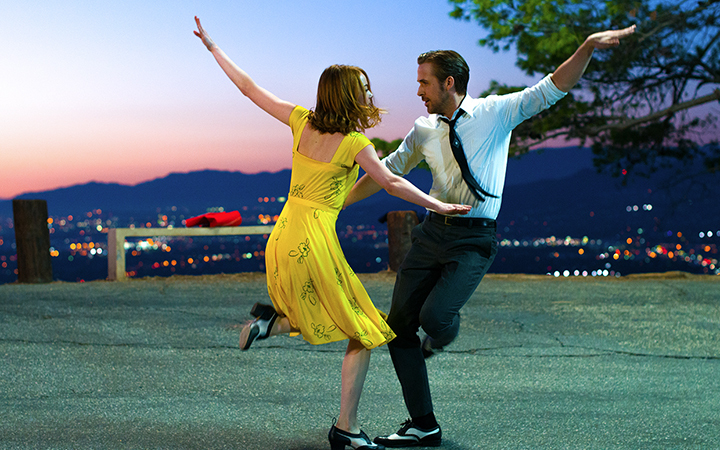 A sumptuously old-fashioned movie musical set in stylish, contemporary settings, La La Land will sweep you off your feet with every sequence, beginning with the very first one. Less than a minute into the opening, a traffic jam on a gridlocked L.A. freeway overpass suddenly erupts into a jubilant, swirling celebration of Southern California weather, outlook and optimism, “Another Day in the Sun,” with dozens of dancers and vehicles stretching as far as the eye can see. Like many of the film’s other sequences, it’s one continuous, uninterrupted take, and it’s jaw dropping. 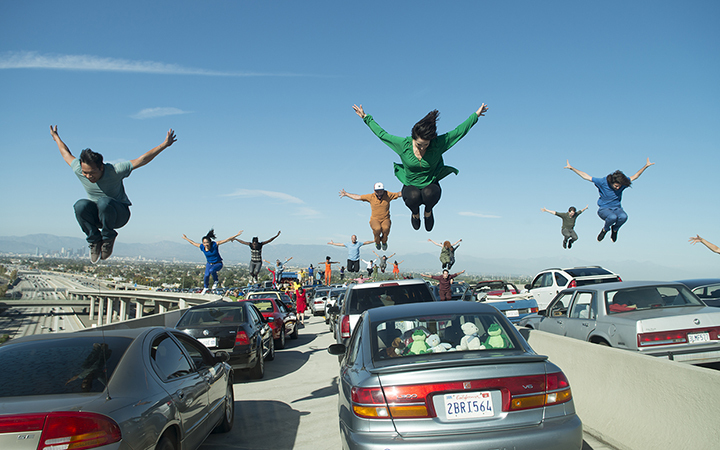 Suffice it to say you will not have seen anything like La La Land in a long, long time. It’s a singing, swinging, prancing, swooping spectacular, full of hopes and heartaches, uplifts and downdrafts. Majestically, symphonically grand, yet intimately, elegantly tender, it’s piercingly sweet, rapturously lovely, fancifully wistful and achingly honest. Gosling is terrific, but Stone has never been better—and her raw, close-up performance of “Audition (The Fools Who Dream),” the final vocal performance in the film, will make you want to stand up and cheer. J.K. Simmons, who won an Oscar for his supporting role in director Chazelle’s critically lauded Whiplash (2014), appears as a nightclub owner who prefers Christmas ditties instead of jazz improv. Grammy-winning musician John Legend plays one of Sebastian’s former band mates whose offer of a gig and financial security comes with a downside of compromise. La La Land, a nickname for Los Angeles, is a place where tradition and innovation—and dreams and reality—collide and comingle, where seasons morph into each other, where the days always seem warm and bright, but the nights can be cold and lonely. It’s a place where two people can come together, fall in love, and sing and dance and make music all over a crazy, classic town—at least in the movies. It ends with one of the best scenes of any movie this year, bursting with emotion and built around a montage that zips through time and loops back on everything that’s gone before, and also everything that didn’t, hangs you in midair and finally slaps you back to “reality.” It’s beautiful, bittersweet and breathtaking. La La Land is a lovely, lush reminder of old Hollywood, with a vibrant jolt of young, exciting energy, pizzazz and romance for audiences too young to remember when singing, dancing stars filled the silver screen. The (Hollywood) Hills are alive again with the sound of (new) music, and wherever it’s coming from, it’s impossible to not be swept up and away in the sweet sunshine of its movie magic.